My cat Jerry died on Sunday. He had had been unwell for about a week and I had taken him to the vet, who gave him antibiotics. Jerry improved a little, but then deteriorated very rapidly and despite an emergency vet appointment, passed away on Sunday morning. He follows his brother, Frank, who died less than a year ago. The pair were always so alike in everything. This is one of the last photos I took of Jerry, in early summer. 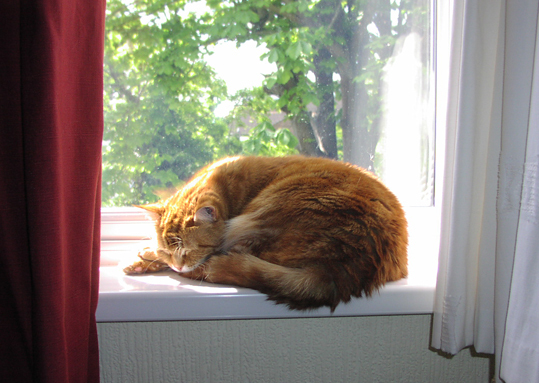 He loved a sunny spot and every morning would sleep in this windowsill next to the desk where I work at home. I will miss him very much. He was a very friendly, intelligent cat; good-natured and peaceful. After he died, when a friend on Facebook said: "May Jerry have good mouse hunting in the Summerlands." I replied: "Luckily, I suspect the Summerlands mice will be as safe with Jerry as the Earth mice were - he was never a great hunter, but he was a very affectionate cat who loved a sunny spot to doze in. I am sure he will find plenty of them in the Summerlands, while his brother Frank - who went to the Summerlands less than a year ago - does any hunting. I know they will be happy to be together again." I am truly sorry for your loss. We had a fine cat named Butch, who we lost about 9 months ago or so. I was very fond of him, as I see you were fond of your cats. Thank you - and sorry to hear that you have also lost your beloved cat. Yes, Jerry was one of the family. I still keep expecting to see him around the house.